Featuring a ruthless outlaw, an eager posse, a worst for wear sheriff and lots of chickens, David Stumpf rustles up a delightful collection of characters for Cowboyland, his Bratislava Academy of Performing Arts animated short. 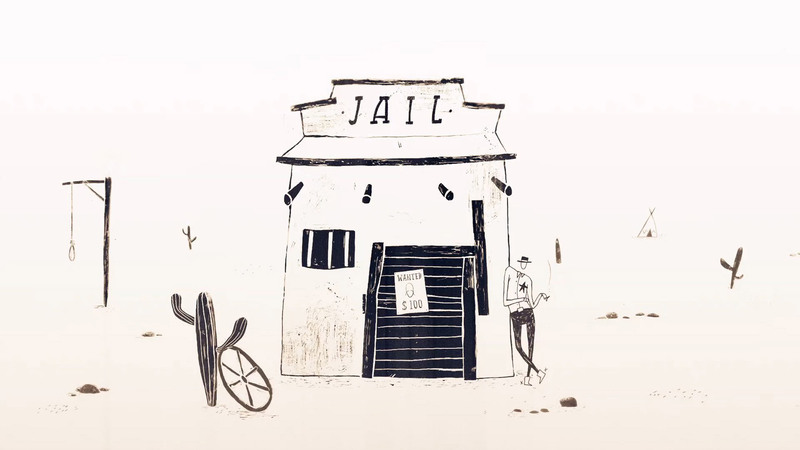 Charmed by this side-scrolling spectacle, DN asked David to share how a desire to step outside of his comfort zone and a tight deadline influenced the structure and design of this black and white, hand-drawn recreation of the wild west. In one of my projects at the Academy of Performing Arts in Bratislava we got the theme of animal dressage. At the last minute, I got an idea of making fun of it, and made some “anti-dressage”. I love westerns and so I came up with the idea of a drunken cowboy who is unable to realize that his horse is not alive, but rather just a common child’s wooden horse. Since I had little time to prepare, many things were improvised and I handled them along the way. Most of the ideas were based on my notebook, full of drunken cowboys, naked women and chickens. I told myself that I had great opportunity to try something new, so I did. Usually I work digitally with a few colors and so the initial artworks for Cowboyland were colored as well. Then I challenged myself to step out of my comfort zone and try something new. I decided to make the film manually, in B&W, which was based on the very first sketches I made with black ink because I like to work with ballpoint pens on paper. I found out, that B&W really worked for the western genre. Also big thanks to Michaela Mihalyi, who really helped me with development and realization of Cowboyland’s look. I would animate with pencil on paper, then line tested it and after corrections, I did cleanups. Then the process started to be really boring – long hours of coloring, scanning, cleaning scans and putting animation together. But after this stage, it was fun again and I could finally see some results for the first time. Compositing was done in After Effects. I also got some help with drawing backgrounds (ink on cells) from Michaela. The process of animation took me about 4 months, coloring and scanning about 1 month and postproduction another 1 month. After completing the first version, I realised I wasn’t happy about it. It was too long and unclear so I made some changes and cut a lot of the animation out and reanimated some things. We knew that sound would be really important for this film, mostly because many things are happening outside of the frame, so we tried to make it as clear as possible. All credit for sound goes to Adam Kuchta, who creatively solved most of the issues related to the sound. We had a really fun weekend recording sounds. We were recording in bars, outside in the park, even in a kindergarten. I think it helped that I was present during the whole time of postproduction, simply because it saves time and is more fun. Next up I am about to start production with Michaela for my new short film The End. The world had behaved irrationally and its punishment was a great flood. A submissive ark caretaker has the future of the entire population in his hands. Noah finds himself in hard-to-solve love triangle with his wife Eva and a widowed Deer. And that cannot turn out well. Even the rational Noah will resort to instinctive behaviour when faced with a series of absurd situations. The Bible story of Noah’s ark transforms into an ironic narrative about how the world sometimes works.